Home › Journal of Physics: Condensed Matter › What’s the difference between defects and amorphous structures? What’s the difference between defects and amorphous structures? The crystalline to amorphous transition is important for the effective production of glassy materials. Domain boundaries, which introduce structural disorder into otherwise crystalline materials, are thought to nucleate the crystalline to amorphous transition, and are themselves amorphous in nature. In addition to their role in the crystalline to amorphous transition, domain boundaries exhibit distinct physical and chemical properties from crystalline regions. For example, the type and amount of domain boundaries can influence material strength, chemical reactivity, and electrical conductivity. With a detailed understanding of the boundaries themselves, domain boundaries can be engineered to optimize desired material properties. We conducted experiments looking at the atomic structure of domain boundaries in silica, a prototypical glass former. A well-controlled sample consisting of only two atomic layers of silica was used. The silica samples can be grown in either crystalline or amorphous configurations. The atomically flat sample surface allowed us to resolve atomic positions using low temperature atomic force microscopy (AFM) and scanning tunneling microscopy (STM) for both crystalline and amorphous silica structures. This enabled direct comparisons between the structure of the amorphous phase and the structure of domain boundaries found in the crystalline phase. 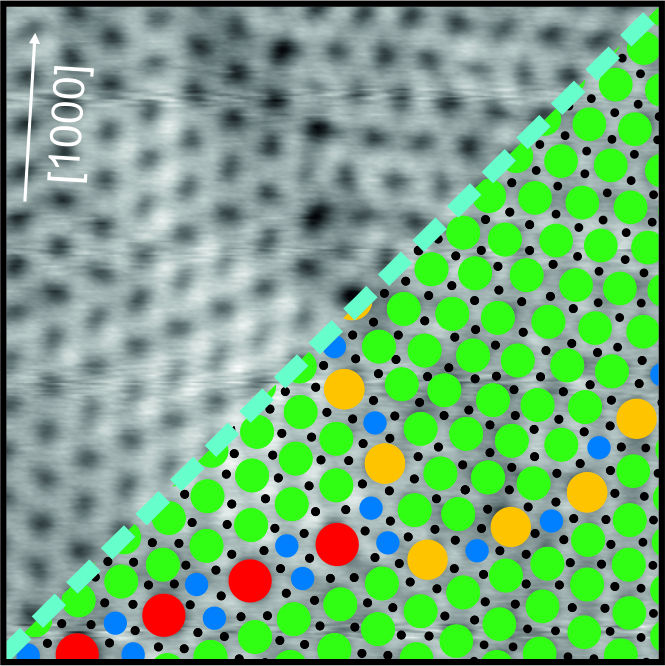 Within a phase of hexagonal silica bilayer, different domain boundaries are observed. Part of the image is superimposed with black dots indicating silicon atom positions, and color-coded circles, indicating different ring sizes. Taken from J. Phys. Cond. Mat 3 035002 © IOP Publishing 2016. All rights reserved. Crystalline domains consisted only of hexagonal building blocks (six-membered rings), while both amorphous structures and domain boundaries include square, pentagonal, heptagonal, and octagonal building blocks in addition to the hexagonal ones (four- to eight-membered rings). Global statistics for the structural units suggest strong similarities between domain boundaries and the amorphous phase. However, a closer look at the local structure reveals that domain boundaries in silica bilayers exhibit order and periodicity that is lacking in the amorphous phase. In a domain boundary consisting of heptagons and pentagons for example, a pattern of alternating pentagons and heptagons is observed such that one could predict the next structural element in the sequence. This periodicity is not observed in amorphous bilayer silica, and indicates that this and other domain boundaries cannot be considered truly amorphous. We also report that the observed domain boundaries are related to the underlying substrate, in this case Ru(0001). A survey of domain boundaries observed in silica bilayers grown on different substrates shows that the substrate may be used to template desired boundary structures. Combining knowledge of domain boundary structure with an understanding about how domain boundaries form may lead to exciting developments in the field of domain boundary engineering, which utilizes domain boundaries to attain desired material properties. Kristen Burson is an Assistant Professor of Physics at Hamilton College in Clinton, NY. Burson holds her PhD from the University of Maryland and was an Alexander von Humboldt postdoctoral fellow at the Fritz-Haber-Institute in Berlin, Germany. Her research interests include two-dimensional materials for nanoelectronics, organic photovoltaics, silica glass, and atomic force microscopy resolution limits. Christin Büchner was a PhD student and is now a postdoc at the FHI. She is interested in the structure and chemical investigation of ultrathin films at the atomic level, and in understanding complex structures like amorphous networks. Markus Heyde leads the Scanning Probe Microscopy group at the FHI. His group specializes in oxide thin films, small metal clusters and atomic resolution microscopy with the aim of developing a detailed understanding of the structural, electronic and optical properties of these systems. Hans-Joachim Freund is the director of the Chemical Physics Department at the FHI, where research is focused on model systems in catalysis. By developing well defined thin-film model systems, his group elucidates the relationship between structure and catalytic activity of materials.